The card base is Tangerine Tango with a layer of Basic Black under a piece of the Motley Monsters Designer Paper. The Designer paper is cut to 5 1/8″ x 3 7/8″. I used a piece of Black chevron ribbon along the side of the card. I wanted to keep the primary image on the smaller side so the detail of the Designer Paper is not covered up. The Stamp set is the new Tee-Hee-Hee stamp set from the Holiday catalog. There are some great sayings and images for Halloween! 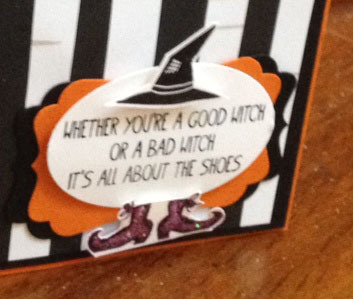 My favorite is “Whether you are a good witch or bad witch, It’s all about the shoes”. So I stamped this with Black ink on whisper white cardstock and punched it out with the extra Large Oval punch. I punched out a Decorative Label using a scrap of Tangerine Tango cardstock and a scrap of Basic Black cardstock and layered them together to outline my stamped sentiment. The punched saying is layered on these two decorative labels. I then stamped the witche’s boots using Blackberry Bliss ink and cut the boots out. To make them sparkle, I painted on a little Dazzling Details over the boots. Last but not least, the Witch’s hat is stamped with Black ink and added with a dimensional to make it pop! This card was inspired by Mary Jo’s sketch challenge at Technostamper.com. Loving the new Holiday catalog! 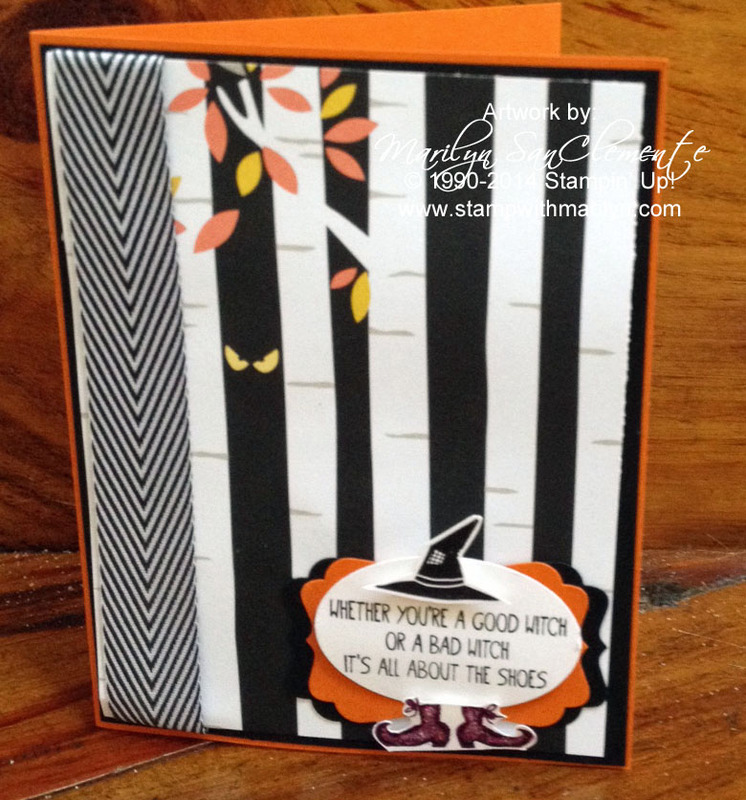 I agree there are some super fun designs in this paper pack–I don’t really do Halloween cards so I didn’t buy it but it is cute. I love how you set up the images and sentiment, really cute. Thanks so much for playing along with my sketch challenge again this week!